I've been vaguely aware of the steampunk sub-genre for quite some time, but being the massively cool trend-setter that I am (that's irony...or sarcasm...it's sarcastic irony, even), I hadn't dipped my reading toes in those toasty waters before I came across this nifty little anthology. Maybe that lack of experience skewed my opinion. Maybe these four tales aren't an accurate representation of a genre with limitless potential. I don't know. All I do know is I fell headfirst in love with the steampunk romance genre because of this anthology and the stories featured in it. Of the four holiday anthologies I picked out to read, this one is my favorite. There's something about the worlds created by each author that drew me in. The characters - especially the female protagonists - and their stories struck a chord with me. They are unique; a breath of fresh air. They are an appealing blend of science and fiction, revisionist history, and creativity. Each novella captivated and entertained me. Some I liked more than others, not all I felt were good fits for a holiday anthology, but each one was a pleasure that I fully appreciated. Even master thieves such as Cornelia Peabody make mistakes, a fact that is driven home with painful clarity the night her sanctuary is breached by a very brassed off professor, one Roderick Coddington. Six months ago, Cornelia stole something truly priceless from Roderick's home, the loss of which sent Coddington's family into a tailspin that no amount of money could reverse. Furious and reeling from loss, Coddington has worked for months on this retribution. He breaks into Cornelia's home, accosts her, and slaps a timepiece on her wrist; a very special time piece. Either Cornelia gets him the property she stole or the timepiece explodes and she dies. She's got seven days. Until Christmas morning. Then...ka-BOOM. I loved this novella! I loved everything about it. Cornelia was a joy of a character. She's a strong, independent female with some definite shades-of-gray morals but with a code of personal ethics and a less-than-pleasant personal history that kept her sympathetic. She's smart, cunning, and no-nonsense, and when she's with Coddington, their chemistry sizzles. I enjoyed her immensely and was utterly charmed by her early in the story. Coddington struck me as a cold, ruthless prat at first, but it didn't take long to warm up to him, either, especially when his lust for Cornelia derails his ferocity at every turn and his opinion of her starts to evolve. The novella has a particularly nice enemies-to-lovers theme in the romance arc. Gail kicks it off fast and furious, then manages to add depth to her characters, widen the scope of their relationship, and add a few twists and turns just to keep in interesting. 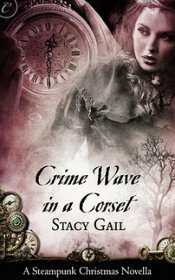 This was a fully complete-feeling novella that made me want to hunt down more stories by Stacy Gail and read every word. I found her writing style and her storytelling smooth, intelligent, and both easy and pleasant to read. Of the four titles in the anthology, I have to admit, this one was my favorite. It's been eight long years since Ophelia Leonides has seen her husband, and if she had any other choice, she wouldn't be seeking him out now. Problem is, the war didn't end well and she's dangerously close to being destitute and having her son taken from her. Her son...and her husband Dario's son. Her ability to convince him of that fact may be the only thing that keeps them safe and gives them any hope for a future. Dario is incensed to find out his wife Ophelia has returned. He cast her out long ago for her deceptions and her lies, but most importantly, for the yearning love and heartbreak he felt despite them, despite everything. Now she is back with the one thing that Dario never dreamed possible, his son. There is little doubt the child is his image. What's in doubt is the child's humanity. He is also, after all, his mother's son. Or so the bewitching Ophelia claims. 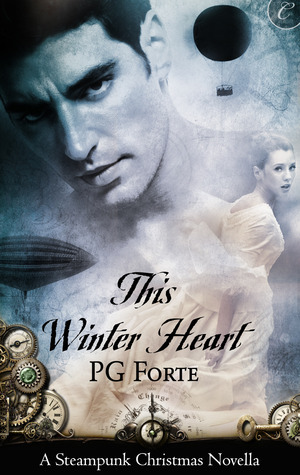 The bitterness in Dario's heart is just as strong as it ever was, and that bitterness may cost him the only two people left in his life who want nothing more than to love him. It will take a Christmas miracle to air all the grievances and heal wounds that run this deep. At times painful and poignant, at times somber and sad, this beautifully written novella speaks of the desperation of love and the painful potential of hope. It draws into question the very definition of life, of soul, and of the ability to feel beyond the boundaries of flesh. Ophelia and Dario have both lost so much, hurt each other so deeply...though admittedly, I felt more sympathy for Ophelia than Dario, who I mostly wanted to bop on the head - repeatedly. With their son between them, the trio made for powerful story. Dario is a hard and unforgiving man, difficult to like at times, but there are chinks in his armor that make him tolerable before he redeems himself. Ophelia's inner core of strength and compassion are a testament to love and motherhood. She's ultimately sympathetic, even for those who may tend to agree more with Dario's opinions. I didn't think this novella was as entertaining to me personally as the previous one, but the characters and their issues are deeper and richer, the plot is more complex, and it has more emotional impact. I think it's just as good, a solid five star read, but it's very different in tone. Heiress Esme Smith needs a man. Not for so pedestrian a purpose as romance or physical intimacy, but to go where she can't, be what she, for her gender, is barred from being. A voice for suffrage in her colony. Esme is intent on her goals, with a vision for her Australian territory that includes women's rights, aboriginal rights - including the vote for both - and freedom from Britain's greedy tyranny. But she needs a mouthpiece. A male mouthpiece who can enter the clubs closed to women and put forth her politics, represent her ideals. And convince the population in the meantime. She needs a man. American Jed Reeve was minding his own business as the ship pulls into port, happy to be in Australia after a long trip from the States. 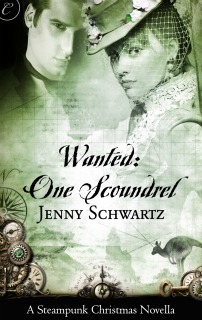 He wasn't expecting to have such a bright beauty as Esme Smith propose such an outlandish partnership before he'd even set foot on her soil, but Jed's more than happy to roll with the punches, as it were. And if partnering with the fiery, politically passionate Esme gives him an opportunity to win her hand as he represents her causes, then he'll consider himself doubly blessed. There was much to admire about Schwartz's novella. Though it's slightly outside the realm of what I consider a holiday novella, really, as winter Down Under is in July, I did like how some measure of Christmas revelry was included. I also thoroughly enjoyed the glimpses of colonial Australia provided. I don't often read much with that setting. 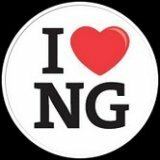 I thought the characters were likable, the storyline well developed and thoroughly evolved, and as a woman, I surely sympathized with Esme's political platform. I also enjoyed the thread of suspense woven into the storyline. It added another nuance to the anthology as a whole. I wasn't as satisfied with the romantic story arc in this one as I was in the two that preceded it. Maybe it was Esme's intent focus on her suffrage movement, but I didn't really feel she was much of an active participant in any developing relationship with Jed. That was a shame, actually, because I liked Jed quite a lot, and I certainly felt his attraction to Esme. That chemistry just seemed a bit too one-sided to thoroughly appeal to me as a part of a satisfying romance. A little more focus on their romance and slightly less on the political jockeying would have elevated this read for me. I liked it, but it fell short of any deeper emotional connection and was my least favorite of the four. His job got his wife kidnapped. His job got her viciously tortured. His job almost killed her. His job saved her life and changed her forever. 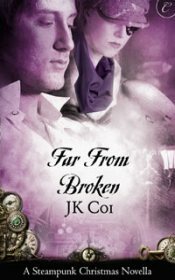 It's been four months since Colonel Jasper Carlisle left his battered and broken wife Callie in the hands of a doctor he believed was her only chance for survival. He left because she wouldn't stop screaming when he was around. He left to hunt down the monsters who broke her. He broke them all. All except the traitor most responsible. Jasper didn't know who that was. Yet. He'd find out. For now, he was returning to his wife with every intention of taking her home for the holiday. Rage. Loss. Sorrow. Disgust. Betrayal. Calliandra had been a prima ballerina married to the love of her life once. Now she was something she could hardly comprehend married to a man who had lied to her about who and what he was. Her eye, her hand, both legs from above the knee...gone. Replaced with metal, with machinery, and in her blood the little mechanisms that made her able to use them as she had her own limbs, her own eye...but better. And so very much worse. Now she's been conscripted into duty for her country, the payment for the technology that's saved - and damned - her. Now Jasper has come, trying to reconnect with her. But she's dead inside. And if he touches her heart, it will shatter. She will shatter. Again. Dark and intense, I can't say that this novella is my idea of a warm holiday read. It's got a bit too much blood, torture, and pain to put me in mind of roasted chestnuts and kisses under the mistletoe. That being said, it was a fairly awesome read. I kept thinking the Bionic Woman meets the Napoleonic Wars as I was reading it, but I'm probably dating myself terribly to admit that. Coi did a great job capturing the painful emotional repercussions of the sort of trauma and healing Callie endured, and the relationship issues between her and her husband as a result were realistic within those parameters. It's a relatively short novella with a whole lot of plot crammed into it, though, so something had to give. In this case, the evolution of Callie's character was a bit disjointed. She started out very withdrawn, struggling with a quagmire of emotional detritus and seeming both unwilling and unable to deal with Jasper, her physical changes, and her new responsibilities. I can't say I blame her for any of that, really, but where I would have enjoyed a more gradual shift in attitude and healing, with a more realistic relationship evolution with her husband, there seemed to be a few small steps of progress preceding an abrupt paradigm shift that seemed too fast and too convenient. To be honest, though, I didn't mind that so much. The novella became much more enjoyable a read after that shift. Caused a bit of a conundrum, really. And I liked Callie much better at the end than I did at the beginning, as self-pitying heroines don't do much for me, even when they're given as much cause as Callie is. Still, it's a great novella. Imaginative, dark, and chock full of emotion. I can't say it was a good fit for a holiday anthology. Not unless you like your eggnog with side orders of stabbing, beating, and mutilation, anyway. It was pretty darn impressive despite that, though, and well worth a read. I enjoy the steampunk genre quite a bit. If you haven't already read A Clockwork Heart by Dru Pagliassoti, I recommend it. Very good book. The covers are SO beautiful, aren't they?? And I love that Carina Press sells the titles individually, too (though of course it's cheaper to buy them together). 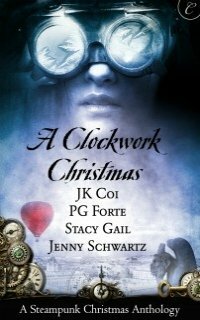 For my first experience with steampunk, this anthology really rocked my world. I've added A Clockwork Heart to my list, Mariana! Thanks for the recommendation! !